On the lookout for portable projection? Sure, us too. 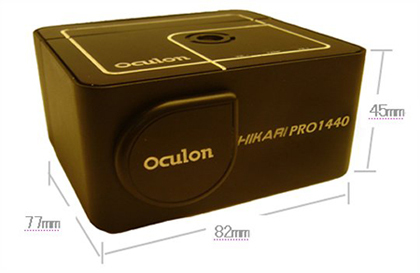 That's why we were pleased to see these new Oculon Hikari Pro1440 and Pro920 (pictured) projectors land in our tips box this morning. The pair can project a 15- or 20-inch display from a distance of just 2-feet. The $399 Pro1440 LCoS model throws 250 lumens across a 20-inch, 800 x 600 pixel display from Composite or D-Sub15 RGB connected sources including game consoles, laptops, and portable media players. Things drop down to 25 lumens across a 15-inch, 640 x 480 pixel display for the $299 Pro920 which measures just 86 x 44 x 85-mm. "World's tiniest," as Oculon claims? Maybe. At least until TI and Microvision get their acts together. Pro1440 pictured after the break.